When the first Royal Oak was introduced in 1972, nobody could have guessed how popular the design would be in the 21st century. Based on that original design, Audemars Piguet introduced the Royal Oak Offshore collection 20 years after the first Royal Oak. 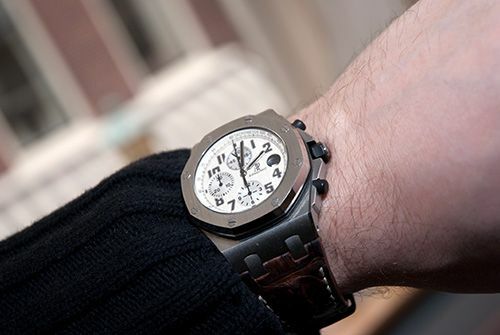 At least here in The Netherlands, the Royal Oak Offshore is very popular and in my humble opinion, it is one of the watches that caused the end of the hype around the stainless steel Rolex Daytona (given the fact that it is widely available again and that they are going for list price). However, given the fact that I am the proud owner of the Royal Oak model that comes closest to the original of 1972, how does this Offshore compare to its ancestor and is it actually a true alternative for the ultimate cult chronograph, the Rolex Daytona ref.116520? A few weeks ago, I was able to review a Royal Oak Offshore Safari (26170ST.OO.D091CR.01) from Dutch watch dealer Watch-Site and I finally have some time to share my findings with you. 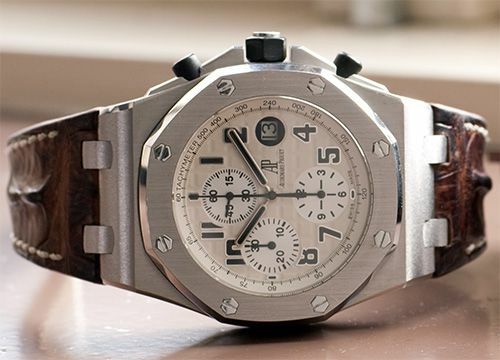 The watch case is a lot bigger than the original Royal Oak model and not only that, but also a bit different in shape. 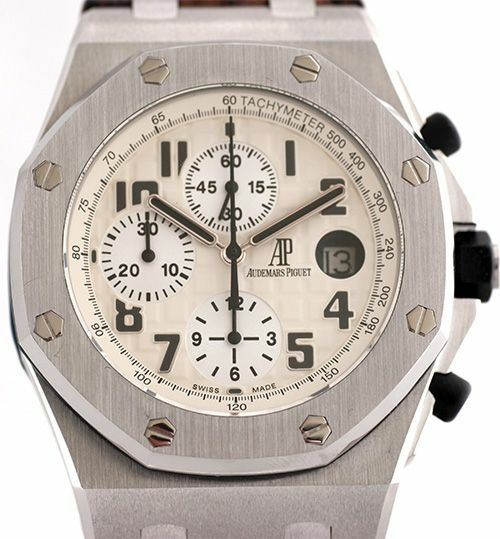 Edges are not as sharp as on the original Royal Oak models, and most parts of the watch are a bit more round in general. 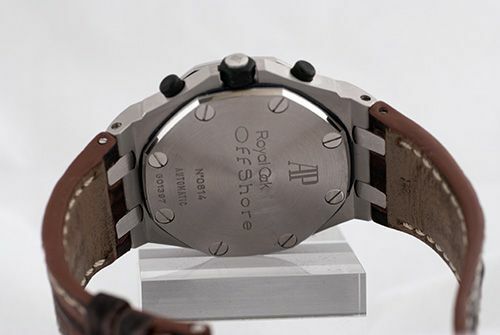 The Offshore models are famous for their rubber parts, like the thick rubber gasket between the bezel and the watch case and the rubber protectors for the crown and chronograph pushers. Although not very visible in the picture above, the crown and pushers are not aligned. However, the date window already should have told you that this movement is not a dedicated chronograph movement but a regular movement with an additional chronograph module (this method is called piggybacking). The base movement is an in-house movement, that has been used by Audemars Piguet since 2005. The regular Royal Oak Date Automatic (ref. 15300) has the same base movement (caliber 3120), amongst others . The movement used in the Safari (and other Offshore Chronographs) is referred to as caliber 3126/3840, with 59 jewels and a 55 hour power reserve. A high number of jewels for a chronograph movement will tell you that it is a piggybacked movement most of the time. Nothing wrong with that of course, but the purists amongst us will prefer a dedicated chronograph movement instead. Personally, I think you shouldn’t expect to get a piggybacked chronograph movement in a 16.000 Euro timepiece, although it would be mainly because of the misalignment of the crown and pushers. As you can see in the picture above, the (round) screws are going in via the back of the watch and the white gold screw in the bezel is actually a hex nut. The case back of the AP ROO Safari actually says all that is necessary on the back, except for its 100 meters of water resistance. The production number is a combination of a letter and a few digits and then again a few digits with No. in front of it. The letter (G in this case) should tell us something about the year, 2007 and the rest is abracadabra to me. My own 15202 has an F-number, and dates back to 2006. If anyone can explain me the logic behind these numbers, I would be very grateful. With approximately 800 employees in Switzerland and 200 in foreign countries, Audemars Piguet is able to manufacture between 25.000 and 30.000 watches per year. So, there has to be something going on with the combination of these two identifiers in the back of the case. So, is it a good and modern alternative for the once highly sought after Rolex Daytona? Most Rolex fans will tell you that there is no substitute, and a lot of AP fans will probably tell you the same. Apples and oranges indeed. Fact is though, that the AP ROO has become the watch of choice for bankers, soccer players and movie stars, where there was once only one ruler, the Rolex Daytona – preferably in stainless steel. Beauty is in the eye of the beholder, but movement wise, I think the Rolex is more interesting with its in-house developed chronograph caliber 4130. When it comes to the resell value, the Rolex Daytona is – although the hype is over – still good to go quickly for cash that comes close to retail. A Royal Oak Offshore Safari Chronograph has a list price of 16.100 Euro, while you can get a BNIB model between 11.500 and 13.500 Euro. Used models, like the one reviewed, are approximately 10K Euro. 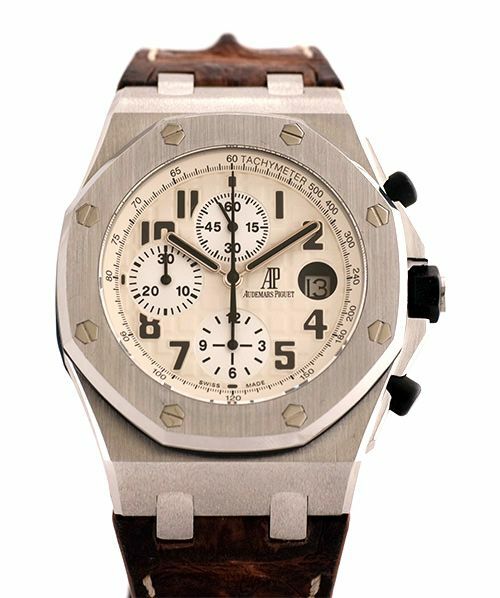 One reason or another, you can bargain a lot on a new Audemars Piguet or get an occasion for almost 6K under list price. This could be seen as an advantage as well I guess, as long as you aren’t the guy who bought one for list price. The 44mm x 14.75mm dimensions might not look good on everyone’s wrists, but I surely found the watch to be comfortable yet very ‘present’. 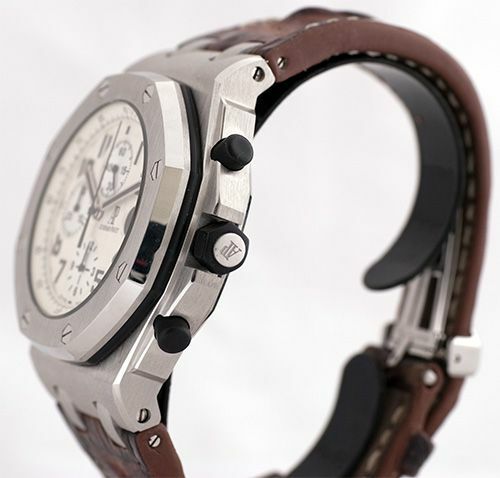 I do think that it is at least the nicest Offshore model available right now, with its brown alligator hornback strap, stainless steel bezel (instead of rubber) and easy-on-the-eyes dial. Thanks for reading and let me know what you think of this timepiece by leaving a comment below. Thanks to Watch-Site for lending me the watch.